Someone suggested that this Locomotive might have been in a Movie and/or TV Show called: Prison Break ! Can anyone in Railroad Forums Confirm this ? According to Wikipedia, Prison Break was a TV series that ran for a few seasons. I vaguely remember it but never watched it. Maybe another member was a fan and can help you. I did find this? although this had #343 in the photo. Here is another one after the collision with the police cars. I did not want to post the photo as it is on railpictures.net with copyright of Jim Satterwhite this shows engine #343 also. The train hit the cruisers at 40 MPH. According to Wikipedia, Prison Break was a TV series that ran for a few seasons. I vaguely remember it and never watched it. Maybe another member was a fan and can help you. Thank You for verifying that, in Fact an AMTRAK Engine was used in a TV Series ! 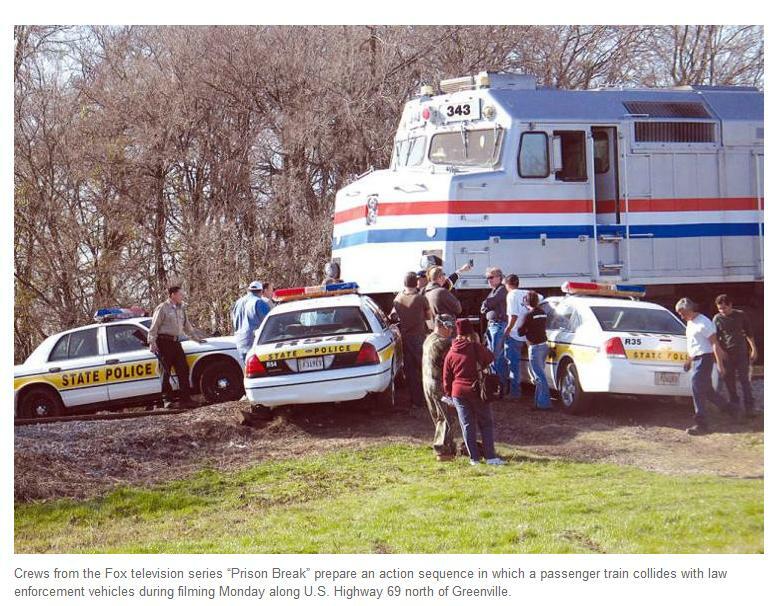 Thank You for Verifying that an AMTRAK Locomotive was used in the TV Series "Prison Break"
Here is another one after the collision with the police cars. I did not want to post the photo as it is on railpicturs.net with copyright of Jim Satterwhite this shows engine #343 also. The train hit the cruisers at 40 MPH. Although the Number was wrong, it had the Big A N Lettering on the side of the Engine in the railpictures.net Picture , which absolutely Confirms that they used AMTRAK Engines, maybe they used more than one engine or else maybe the the Engine Number was Changed. I'm a new member to these Forums, so I'm kind of poking around when I try to ask questions or post messages. Therefore I hope you can see my Reply ! Thank You very much for Helping me confirm that the Engine I saw in Lake Wales, Florida was in fact used used in the TV Series ! Now I can Update my Photograph on flickr™ ! Now I can Update my Photograph on flickr™ ! https://flic.kr/p/2ehQ6VE SEE the BIG AN !